We hope you will join us for a full day of movement in Madison, NJ. We are so grateful to our hosts, Jill Denninger and Michelle Kennedy, co-owners of Bodies in Balance, for inviting us. Join us for a Pilates Mat class, a Pilates Workshop or a combination of any three! Hello Friends! Check out our June Newsletter to see what we’ve been up to at MoveCoLab and to find out where we’ll be next. If you haven’t already, be sure to subscribe to our newsletter by clicking on the email icon at the bottom of our page to stay connected! 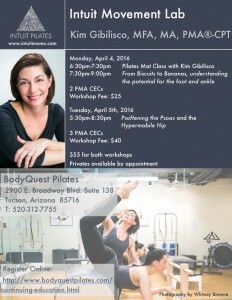 Arizona Tour: Join Kim and Bob for a week of movement in Tucson and Phoenix! 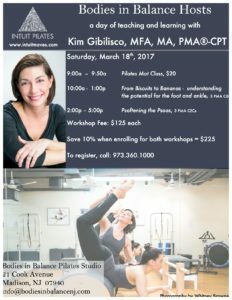 Hip Me with Your Best Shot (3 PMA CECs) – Workshop with Kim Gibilisco and Bob Turner – ONLY 4 SPOTS LEFT! 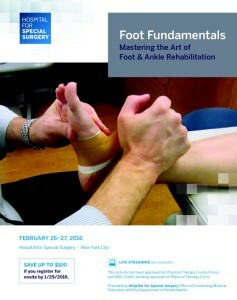 Bob is pleased to have created the course Foot Fundamentals: Mastering the Art of Foot and Ankle Rehabilitation to be presented at Hospital for Special Surgery on February 26-27, 2016. He has assembled experts in the fields of orthopedic surgery and orthopedic physical therapy into a two day comprehensive program. 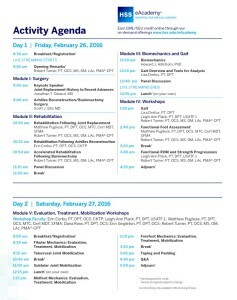 The second day is a hands on lab course where he will be teaching his specialized manual mobilization techniques to physical therapists. For enrollment, please contact the number listed on the brochure. “Hip Me With Your Best Shot” is designed to enhance the participants’ understanding of the various challenges encountered and viable solution options when working with clients with labral pathologies. To date, there are no bona fide guidelines for the pre and post-rehabilitation of hip scopes for labral pathologies. However, both Physical Therapists and Pilates teachers frequently encounter pre and post hip scope patients/clients. Successful outcomes incorporate identifying adequate ranges of motion with optimal joint congruency, alignment and efficient neuromuscular recruitment strategies in a pain-free environment. 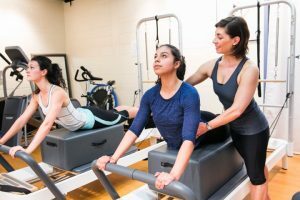 Utilizing Pilates mat and equipment, participants of this workshop will understand the rationale behind re-creative strategies using the Pilates repertoire and apparatus. This workshop includes a lecture incorporating a review of surgical and non-surgical options followed by a demonstration of tailored Pilates exercises with home program. The goal is to offer new movement strategies and viable solutions for care and conditioning to an ever growing population. Kim will be traveling to Cologne, Germany from August 10 through August 20 for an interactive teaching and learning tour. She will be delivering classes and workshops at Polestar Pilates Educator Alexander Bohlander’s space, Springs, and is looking forward to learning from Alexander and his skilled team! Visit www.polestarpilates.de for more information on Alexander Bohlander and Polestar Germany.